Lorraine is one of the first volunteers to sign up to the Community Northern Beaches ESL Conversation Project. Earlier this year, it became apparent that although many new Tibetan migrants have completed courses and are now qualified for work, they may not be taken on by employers due to their lack of English skills. Thus, the ESL Conversation programme was born. The programme involves a volunteer being matched with a Tibetan local with the aim of them meeting once per week in a public place to participate in an everyday situation such as having a coffee or shopping. The end goal of this programme is simply to ensure new migrants have enough conversational English to feel confident in a job interview and be able to follow instructions when offered a job. 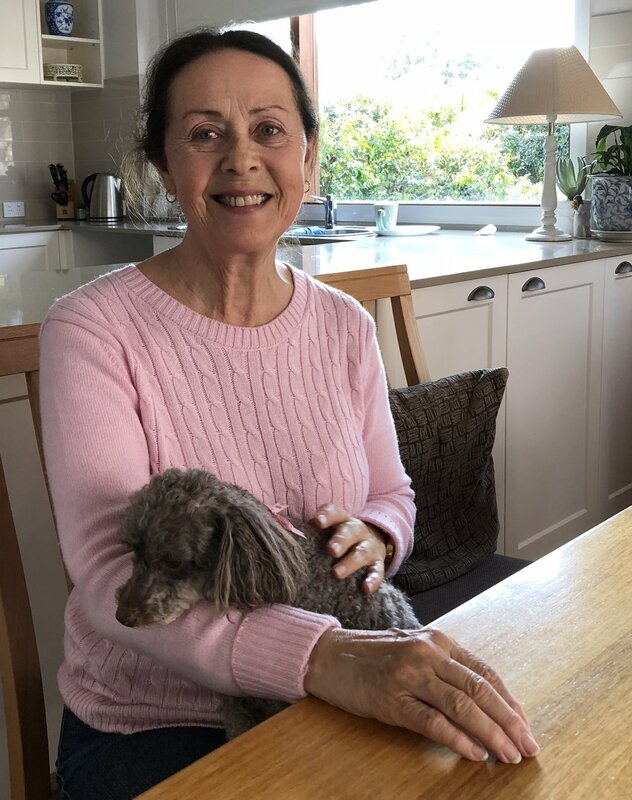 Lorraine is a professional singer who has lived on Sydney’s Northern Beaches for 3 years with her partner Joe and their pet poodle, Lucy. Lorraine has no previous experience teaching English and although she admits to feeling daunted initially, she is now thoroughly enjoying the experience of volunteering and finds it very rewarding. A bonus is that Lorraine has learnt so much about the Tibetan culture which she finds fascinating. Her experience has proven so successful, that Lorraine is currently in the process of being matched with her second Tibetan student. What motivated you to volunteer as an ESL Teacher? For some time now I have been watching the news about Syria, but had no idea how I could help people so far away. It then struck me that migrants of every nationality have experienced horrific and challenging times in their own countries, so perhaps I could help the migrant community on the Northern Beaches in some small way. I saw an article in the Manly Daily with a photo of Maria Chidzey, so I thought I would go along to the information day. It worked out that my student (from Tibet) was available at the same time as me, on a Tuesday, so it was a convenient match. Jigme and I meet once per week at Dee Why Library. We allocate an hour but we often keep going when the hour is up. We’re both flexible and enjoy the arrangement. We have become good friends. Does your student, Jigme, speak much English? Very little. She is keen to pass her certificate to allow her to work as a cleaner, so I have been spending time teaching her the things she needs to know to pass that test such as colours and important signs and labels. Jigme is also at TAFE but she finds the courses rather overwhelming at times, so I help her with that too. What skills do you think are helpful to volunteer for this programme? I think it’s very important to be patient and take time to develop a good relationship with your student. Settling into a new country is not an easy experience for anyone and it’s a privilege to be able to help new migrants to learn English and hopefully make it a little easier for them to navigate their lives in this country. What challenges have you faced as part of this programme? I have had to consider Jigme’s cultural background and the difficulties she may have lived through in order to get to Australia. I always remind myself to be culturally aware and allow her to let me know what she needs from the lessons rather than be rigid in imposing my own ideas. She is quite shy and building her confidence is challenging sometimes, although she is very keen to learn and we have now developed a wonderful friendly, trusting relationship. If you would like to know more about volunteering for the ESL Conversation Programme or are a new migrant looking to improve your English, please contact us for more information. Newer PostThe Sisterhood with Tracey Spicer - Sell Out Event for Local Charities!